It’s time for another fascinating episode concerning the slippery little comma. There’s a good reason it’s the most misused punctuation in the English language. The rules are many and varied. Like most definitions, it’s dry and can use some clarification. Flip back to the past. Picture me in eighth grade, listening to Led Zeppelin, Rush, and Queen. Unlike the stereotypical rocker, I did my homework and actually took it seriously. And I noticed that left to my own devices, I was completely unable to construct a paragraph without parentheses. It just seemed to be the way my mind worked. And this was pen and paper days. Word processors existed–but not for eighth-graders. I didn’t want to keep re-doing stuff if I didn’t have to. It left more time for memorizing rock lyrics. Parentheses are visually distracting, and it seemed I shouldn’t have to rely on them that heavily. I knew my favorite authors didn’t. So I cracked open some Tolkien, Austen, and Alcott to see how they did it. Voila! They merely used commas where I used parentheses. Problem solved. I don’t recommend over-reliance on parentheses to learn the rule, but it’s a good benchmark of when it can be used. If you’ve got a clause, phrase, or word that’s really an aside, set it off with commas from the main sentence. I. These are all examples of clauses used parenthetically. Led Zeppelin, who didn’t have their lyrics printed with all their albums, required many hours of listening for me to get them all written down. JRR Tolkien, whose works were the most beloved of the twentieth century, seemed like a miracle when I discovered him. My teachers, who were remarkably patient in retrospect, had to read a great many sentences about Bilbo Baggins and Jimmy Page. If you look at the above three sentences, you can take out the clauses set off by commas and the sentence still makes sense. You could rationally rewrite them using parentheses. Led Zeppelin (who didn’t have their lyrics printed with all their albums) required many hours of listening for me to get them all written down. I DON’T recommend doing this; it’s visually distracting (as I said before). But it’s a useful test. The above are all clauses according to Purdue because they all have a subject and a verb. But this can also be done with phrases and words. II. Phrases lack either a subject or a verb. As covered in Commas and Introductory Phrases, these can take many forms–prepositional, appositive, participial (tricky little devils), infinitve, and absolute, among others. Prepositional phrases (under the covers, behind the door, between your toes) are NOT usually set off with commas unless they come at the beginning of the sentence and are at least five words long. Appositive phrases are easy to handle once you know what they are. Essentially, they rename the subject. Set them off with commas. Rush, my favorite Canadian band, always does a great live show. JRR Tolkien, a writer of impeccable taste, enjoyed reading Lewis, Chesterton, and MacDonald. Jimmy Page, a gifted guitarist, played for Led Zeppelin. However, if the appositive phrase begins with the word that, it is considered essential and is not set off with commas. This can also be be the case with the word who, if it is used the same way as that. The dog that didn’t bark was a clue that Sherlock Holmes found to be curious. The rock star who goes into rehab has become a cliche. A participial phrase begins with a participle. A participle is a verb that ends in ing (present tense) or ed (past tense), as well as the alternate endings for irregular verbs. A participial phrase acts as an adjective–it modifies a noun. 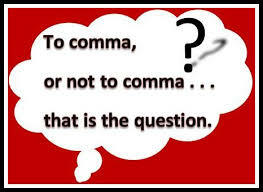 Most of the time, participial phrases get set off with commas. (See Commas and Introductory Phrases for exceptions.) It’s still a squidgy area to explain. I hate the pause test because it so often fails, but it seems to be the best one here. If you would naturally pause saying the participial phrase, it’s parenthetical and should be set off with commas. Jane Austen, writing ahead of her time, is still widely read today. Bilbo Baggins admired Sting, shining brightly in the sunlight, and decided maybe he was up to adventuring after all. The student, glaring at the test, finally filled in the answer bubble. Infinitive phrases are straightforward. They use the simple form of the verb with the word to in front. Set them off with commas. President Kennedy’s goal, to reach the moon before the end of the Sixties, was realized on July 21, 1969. My dream, to be able to spend whatever I like at the grocery store, seems unobtainable at times. Absolute phrases are really handy for descriptive purposes. They combine a noun and a participle. Set them off with commas. The watchdog, her throat hoarse from barking, finally laid down to rest. The intrepid hobbit, sick to death of Gandalf being an insufferable know-it-all, still managed to hold his peace. The writer, fingers bleeding from typing blog posts, gave her all for comma awareness. III. Words used parenthetically will almost always be an adjective or name. Names in this context include words that aren’t proper names, but act like them in the sentence. Bringing an egg salad sandwich, however, might be an unwise choice on a hot day. He finished mowing the grass, finally, and ran down the street to his friend’s party. This blog post will be finished, eventually, and we can all celebrate. Listen, Jane, you don’t have to go. Wait up, guys, or I’ll get left behind. If you don’t do better on the next assignment, class, then you’ll have to take the consequences when grades are posted. Tolkien wrote some seriously beautiful sentences. I’ve always admired his work, and I had to wait a long time before I felt like I had a voice that wouldn’t be nothing but poor mimicry of his. I’m so glad these posts are helping other people. I used to teach, so I usually feel like I can improve on the available material. 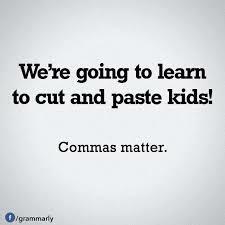 And apart from that…I just used to use commas instinctively. I couldn’t tell you why each one had to be there. I got back my first line edit and was bummed over not being as cool as I thought I was. So I decided I’d learn it well enough to teach it. Then I’d own it. But it’s good to know they’re useful for others, too.